Here's an Operation Christmas Child shoebox we packed for a 5-9 year old girl this year. This shoebox was 342 inches cubed, for comparison, a GO box is 306 inches cubed, so it's pretty close in size. If you'd like ideas for other ages be sure to check out my posts on boxes from this year for: Girl 2-4 years, Boy 2-4, Boy 5-9, Girl 10-14, & Boy 10-14. NOTE: Different countries have different restrictions on what can be packed in an OCC shoebox due to customs, and 2016 is the last year for candy in the USA. Be sure to check the guidelines from your national organization before packing! We share Why We Include a Stuffed Animal in Each Operation Christmas Child Shoebox We Pack in this post. Candy ( bagged & in original wrapping) UPDATE: As of 2017 no candy is allowed. You can see we started by putting the flat things in the box, flat against the sides. More flat things along the sides (shoes, soap case, etc). I slide the composition book, small coloring book, and colored pencils down the side, the blanket went flat on top. The composition book then bent over the top, the advantage to soft ones! Many people ask about adding a full size notebook in a shoebox so I wrote a post about it: How to Fit a Full Size Spiral Notebook in and Operation Chritstmas Child Shoebox. There are more details on the various ways one will fit. 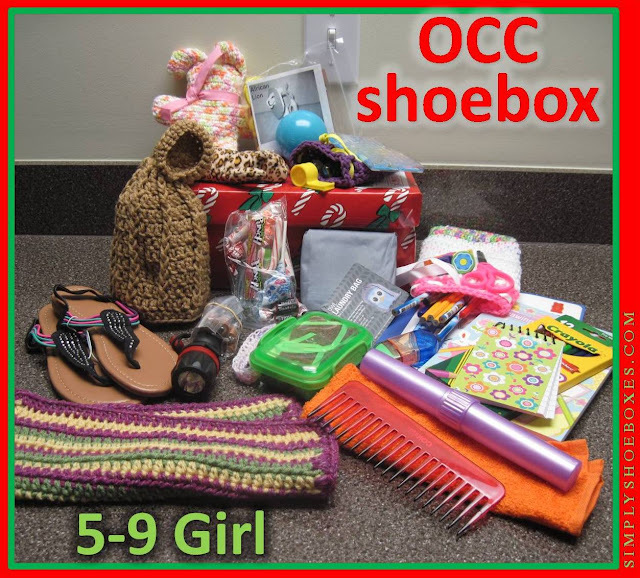 You may also like to check out our complete series on How To Fit More in An OCC Shoebox.